Mytour Vietnam Company Limited was established and officially came into the OTA market since 08/2012. As an online travel agent, Mytour Vietnam specializes in providing hotel booking services, flight booking services, and tour booking services with extremely attractive rates, easy and flexible payment methods. What makes the difference of Mytour Vietnam brand is from the dedicated, professional, well-trained team and 24/24 online booking support. In addition, with many useful features on the website such as: Search vacancies, Find hotels with promotions, Find cheap hotels ... Mytour helps the customers to plan their trip in the most convenient and fastest way. During the 5 years journey of establishment and development, Mytour.vn brand increasingly has become more and more a reputable brand, has been proved to be one of the best OTA in Vietnam tourism market. With the guiding principle of “quality and trust as the foundation”, Mytour Vietnam is very focused on building human resource. We give a great welcome to talented and enthusiastic individuals - who are willing to devote all their efforts to build up the great development of Mytour.vn in the future. 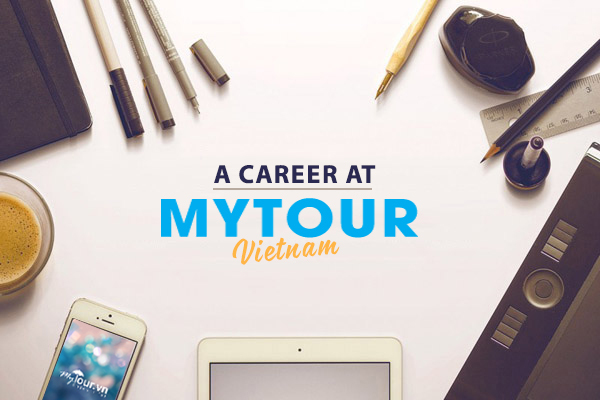 Working with Mytour.vn, you will not only learn more and more useful knowledge, gain valuable practical experience but also other interesting things in a professional, dynamic and open working environment. Mytour.vn promises to be an exciting playground, a potential place that leads you to higher steps of your career path. Beside the attractive benefits you will get while working with Mytour.vn, you will have opportunities to express yourself and to show your talent. At Mytour.vn, you will be free to talk about your ideas, to contribute, propose your own creative ideas. We know that you are the boss of your own. You will always be heard, be cared, be understood and be respected. At Mytour, you have chances to promote your strengths, show your ability and explore the potential of yourself. You will be trained to develop your skills, to overcome your weakness and step by step to improve yourself. No matter which department you work in and which position you work in, you will always feel proud of your own work and your achievements will always be appreciated. Mytour.vn will bring you challenges and career opportunities, help you to soar to a new height. Working with Mytour, you will have many chances to participate in projects, interesting events. Mytour.vn organizes annual holidays to let you discover new lands, you will also receive gifts on your birthday. You will not be limited to certain uniforms, you are free to express your style and personalities. We know that just by being yourself, you will feel comfortable and confident when working, communicating with people. Mytour.vn will be like your second home, will always give you warm, cozy feeling as you’re at your own home. Mytour.vn will be a place to store many beautiful moments and unforgettable memories of your career path. No matter who you are, if you want to learn more and work in this dynamic, professional environment, let join us! The door will always be open at Mytour.vn.